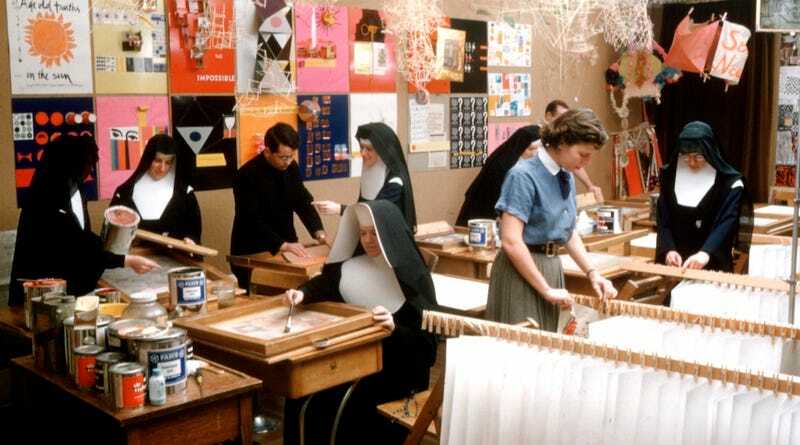 During the 1960s, a woman named Corita Kent transformed a tiny art department in a Hollywood Catholic school into a global center for design and printmaking. She was buddies with Buckminister Fuller and counted IBM as a client. Oh yeah, and she was a nun! The new book Someday is Now: The Art of Sister Corita (DelMonico Books/Prestel/Tang Museum) is the first full-size monograph of the highly influential artist and activist, featuring images from her studio as well as reproductions of her vibrant, almost neon posters and serigraphs. Kent's work was unapologetically positive, drawing inspiration from scripture, advertising and the streets of Los Angeles. Her prints featured phrases and graphic patterns that cribbed from cultural references and juxtaposed high and low, techniques seen in the work of contemporary artists from Andy Warhol to Shepard Fairey. From 1947 to 1968 she taught art at the Immaculate Heart School in Los Angeles which became legendary under her direction. In the short film Become a Microscope, Kent's students talk about how they visited car washes and supermarkets for inspiration. Each spring the school celebrated Mary's Day, a community festival that featured elaborate costumes and decorations designed by the students. Kent also took her classes on field trips to meet other designers and regularly visited the home of Charles and Ray Eames. Kent's influence reached beyond the art and design world. She also befriended other L.A. film world luminaries like Saul Bass and Alfred Hitchcock, and met with composer John Cage, whom she quoted in her "rules" for her art department (above). Choreographer Merce Cunningham (and Cage's partner) apparently kept a copy of Kent's rules in his studio. Buckminister Fuller described his visit to to her art studio as "among the most fundamentally inspiring experiences of my life." During the late 1960s, Kent's work began to shift, addressing issues like civil rights and the Vietnam War. This sometimes didn't fly with the religious leaders at the school, who also probably didn't like the fact she played rock music during art class. Her relationship to the Catholic Church changed even more after the Vatican resisted reforms that would modernize the church and give more freedom to women. In 1968 she left the church. As an example of a nun who was able to establish her own identity and career, Kent received international acclaim and was even featured on the cover of Newsweek. She was commissioned to illustrate a Love stamp for the U.S. Postal Service, which was released in 1985. Kent died the following year in Boston, where she's probably best known for Rainbow Swash, a mural on a gas tank that's become a local landmark and is reported to be the largest copyrighted art work in the world. The studio at the Immaculate Heart College still exists and has been renamed the Corita Art Center in her honor, hosting art classes and gallery shows in Kent's spirit.